Black Truffle (Tuber melanosporum Vitt.) Minimum size for orders starting at 100gr. Price is per 100 grams and is updated every week according to market fluctuations and the availability of the product. Preserving truffles has always been an important issue to deal with, as truffles spoil rather quickly. It is a live product and it must be preserved with materials that allow it to breathe, thus preventing bacteria from softening it. It must be kept in a cool environment. Before use, fresh truffles must be washed in a cold water pan and use a small brush to remove any remaining grain of sand. We recommend washing only the amount of truffle that will be consumed, as once washed it deteriorates faster. A whole frozen truffle, instead, is sliced or grated onto any dish without thawing it beforehand. Any fresh truffle can be preserved for 15 days maximum. If, however, the truffle starts softening, and you do not want to eat straight away, we recommend freezing it, after washing and drying it, or using it in some other recipe involving sauces, with the addition of oil and salt. Truffles can be used in all dishes, from appetisers to desserts, but always keep in mind that the best way to savour its special fragrance is to use it in the most natural and simple way. Truffles belong to the genus Tuber, and are essentially a subterranean fungus whose entire life cycle takes place underground. Generally, they live in symbiosis with certain trees such as the Turkey Oak, Downey Oak, White Poplar, Black Poplar, Lime Tree, Hop Hornbeam and Common Hazel trees. The Tuber Magnatum Pico and Tuber Melanosporum Vitt are made of more than 80% water, as well as ash 1.97%, total nitrogen 0.88%, non-protein nitrogen 0.23%, proteins 4.13%, lipids 2.08%, soluble carbohydrates 0.36%, dietary fibre 8.43%. The types of fungi classified as Tuber, all over the world, are approximately sixty, 25 of which are in Italy, 9 are of the edible variety and only 6 types are sold. With the scientific name Tuber Magnatum Pico, it is the truffle par excellence due to its commercial importance. It is also known as Alba or Piedmont truffle (Montferrat and Langhe) as it is widespread in this region, but it can also be found in great quantities in several areas of central Italy (Umbria, Marche, Emilia Romagna, Tuscany, Abruzzo and Molise). Alba gave it its name, but it is present in the Montferrat, Langhe and Roero areas in the Piedmont region as well as in the Turinese hills. It has a globular and irregular shape, with depressions on the peridium. The outer surface is smooth and slightly velvety. The colours range from pale ochre, to dark cream or greenish. Its flesh or “gleba” is unmistakably white and greyish-yellow, with faint white veins. 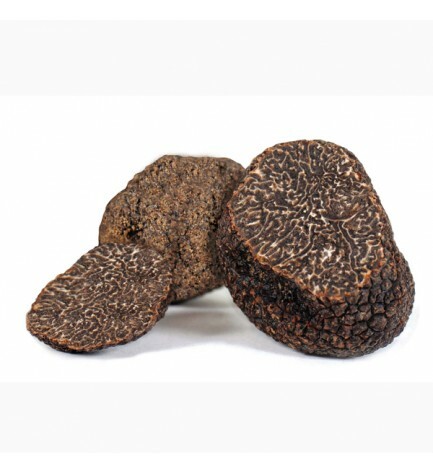 Its pleasant aroma distinguishes it from the garlicky smell of other truffles. It lives in symbiosis with oaks, lime trees, poplars and willows and is rarely found next to other truffles. In order to grow and develop the white truffle requires special soil and climatic conditions: The ground must be soft and wet most of the year, be rich in calcium and have good air circulation. These types of soil are consequently hard to find and it is these environmental factors that explain why white truffles are so rare and sought after. They are harvested from September to December. It has the scientific name Tuber Melaosporum Vitt, and is also known as Norcia or Spoleto truffle, or as truffe de Perigord by the French. It has a fairly regular and round shape with polygonal warts. The external blackish-brown colour is tinged rusty-red when rubbed. The flesh or “gleba” has a light colour. The smell is intense, aromatic and fruity. It grows in hilly and mountainous areas in symbiosis with common hazel, sessile oak and English oak trees. It is considered the most valuable truffle, after the white truffle, and is a star of international cuisine. The harvest period is from December to March. Wherever black truffles are found, vegetation is scarce. Near the trees grass is sparse due to the presence of mycelium. A particular fly may also be seen, the Anisotoma Cinnamomea, that usually lays its eggs close to truffles. With the scientific name of Tuber Aestivum Vitt it can reach a considerable size and is similar in appearance to the black truffle. The outer surface has dark-brown pyramidal warts and an intense aroma, but when cut the gleba does not darken (as with the precious black truffle) but instead tends toward dark yellow. It grows in both sandy and clayey soils, in broadleaf woods, as well as in pine groves. It is highly appreciated and is used in the production of sausages and sauces. The harvest period is from May to December. With the scientific name Tuber Borchii Vitt it is a truffle that is traditionally very sought after in Tuscany, Romagna and Marche, even though its commercial value is lower than the white truffle. Externally, it starts out resembling the Tuber Magnatum, as it is irregular, smooth and off-white, but it is darker when ripe. The gleba also starts off with a lighter colour and then darkens. Its aroma distinguishes it from the white truffle, as it is initially delicate and pleasant, but over time becomes stronger and more garlicky. It grows in calcareous soils and, usually, in broadleaf and conifer woods. The harvest period is from January to March.